​Latest U.S. Census Bureau estimates show Dallas-Fort Worth with a net population growth of 973,431 since 2010, more than Houston, New York, Atlanta, and Phoenix. The Dallas-Plano-Irving metropolitan division, or Dallas, was behind almost 70 percent of that growth with 682,000 net new residents. 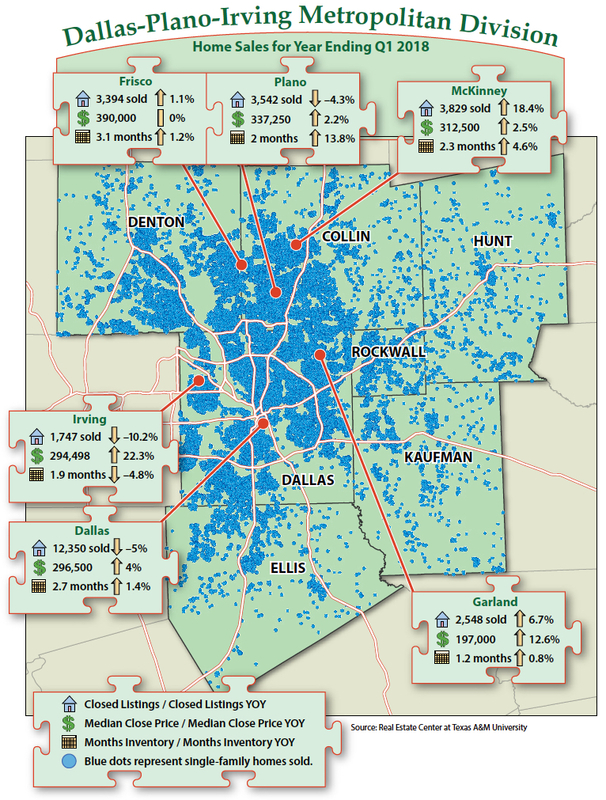 With such large population gains and an expanding economy, it's no wonder that the Dallas housing market is booming. Home prices have heated up but, more importantly, supply has dwindled. How has the market responded, and can the region keep up with demand? Dallas home sales (including new and existing single-family homes, condominiums, and townhomes) for first quarter 2018 totaled 13,560, up almost 2 percent from first quarter 2017. Over the same period, median prices also climbed without much sign of slowing. Median price and price per square foot (PSF) as of first quarter 2018 reached $290,000 and $132, about a 5 and 6 percent increase, respectively, year over year. Active listings finally made some gains in 2017 after several years of decline, resulting in slight increases in months inventory toward the end of the year. However, overall housing inventory levels were still among the lowest in the state. Homes in the lowest price tiers were especially scarce, with some submarkets having as little as one month of inventory. How long the shift in listings and inventory will continue is yet to be seen. At the county level, Collin County home sales for the year ending March 2018 rose more than 6 percent year over year to 17,176 while Dallas County rose slightly over 1 percent to 25,607. Median price in Collin County was up almost 2 percent to $326,050 while months inventory rose slightly from 2.3 to 2.5 months. In Dallas County, median price rose 7.5 percent to $235,000, and months inventory fell from 2.4 to 2.1 months. Dallas' economy consistently continues to be among the strongest in the state. While total job creation slowed in 2017, the overall growth rate exceeded both state and national levels as of February 2018 with a 2.7 percent year-over-year increase. Unemployment was also ahead of state and national levels at 3.7 percent. With Dallas' unemployment rate at its lowest, labor supply has been problematic in a number of employment sectors. Filling construction jobs remains difficult as strong housing demand grows. Despite almost 3 percent annual growth in 2017, job creation in this sector peaked mid-year and has been in a downward trend ever since. This trend could further push up construction and housing costs. Income growth in general has also been slow despite strong economic gains. 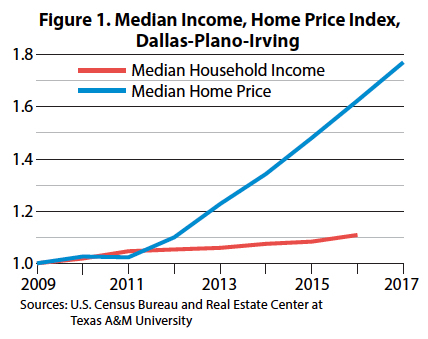 Median household income for the Dallas-Plano-Irving metropolitan division grew by 2.3 percent to $61,817, according to the U.S. Census Bureau's income survey in 2016, the most recent survey. Per capita personal income, provided by the Bureau of Economic Analysis, registered a miniscule growth rate of less than 1 percent in 2016 to $53,082 after posting an almost 4 percent growth rate the year before. Income data typically lag by at least a year, but even if income grew in 2017, homebuying power is still expected to diminish as housing prices continue to rise at sustained levels and mortgage rates begin climbing (Figure 1). Housing affordability remains a growing issue in Dallas as home prices continue rising. According to the Real Estate Center's Texas Housing Affordability Index (THAI), Dallas was among the least affordable metros in the state for overall and new homebuyers. The overall Dallas THAI has fallen from 1.58 to 1.42 since 2016 (Figure 2), a 10 percent drop, while the THAI for first-time homebuyers also fell 10 percent from 1.38 to 1.24. 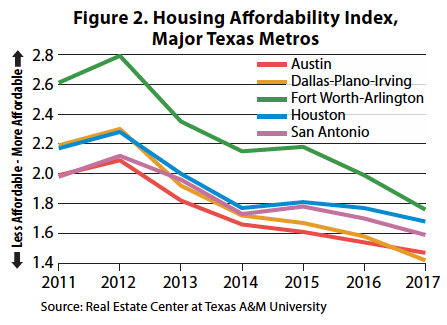 Over the same period, Texas affordability fell over 6 percent for both overall and first-time buyers. 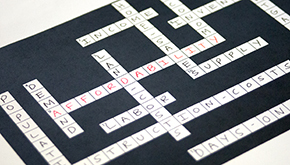 Various market forces have played a hand in the affordability equation. Among the leading factors is dwindling housing supply, especially within key, traditionally middle-income neighborhoods. For example, in Garland, where the median price is $197,000, months inventory has dropped to 1.2 months with an average marketing period of just over a month. These figures are well below the Dallas level where median price is $280,000, supply is at 2.3 months, and the average marketing period is over a month and a half. 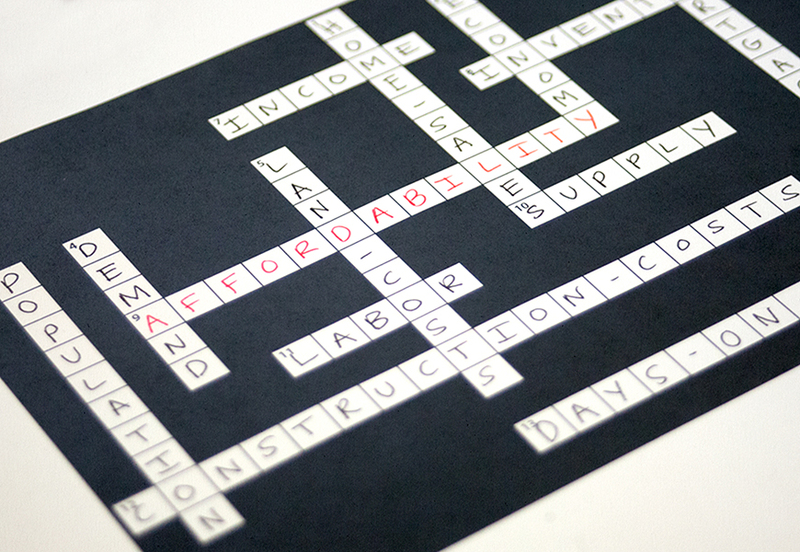 New construction pipeline data suggest the affordability problem is not likely to be solved by new housing stock. Building permits for single-family homes increased 2.3 percent year over year to 56,239 in 2017, but the median new-home price increased by 4 percent to $288,850. The median price for new homes sold through the Multiple Listing Service fell 5.2 percent while median price PSF rose 1.82 percent year over year. The median price of new single-family homes sold was $368,000 for the year ending in March 2018. Days on market for the lowest-priced tier of new homes (those below $300,000) was right at a month while the rest of the new-construction market was at almost three months. Additionally, median price discounts for homes in the lowest price tier were almost nonexistent at half a percent of original list price. Median price discounts for the rest of the market were approximately 5.5 percent. Rising construction costs play a big role in rising new-home prices. Builders focus on higher-priced markets to make their necessary profit margins. This trend is not unique to Dallas. Throw in rising mortgage rates and land costs and many potential Dallas homebuyers may simply be out of luck.